Best deals on closeout, clearance, demo and open box dispensers and organizers. 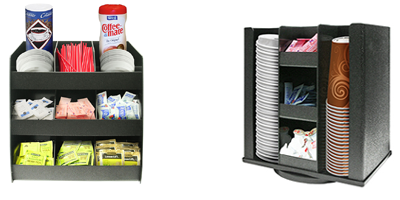 We offer the largest selection, lowest prices, and the most dependable brands for coffee organizers. We have clearance items, closeouts, overstock and product returns that will save you money. Our highly knowledgeable sales associates are here to assist you with any questions you may have before, during and after the sale. If you don't see the product you’re looking for give us a call, most likely we have it in stock.